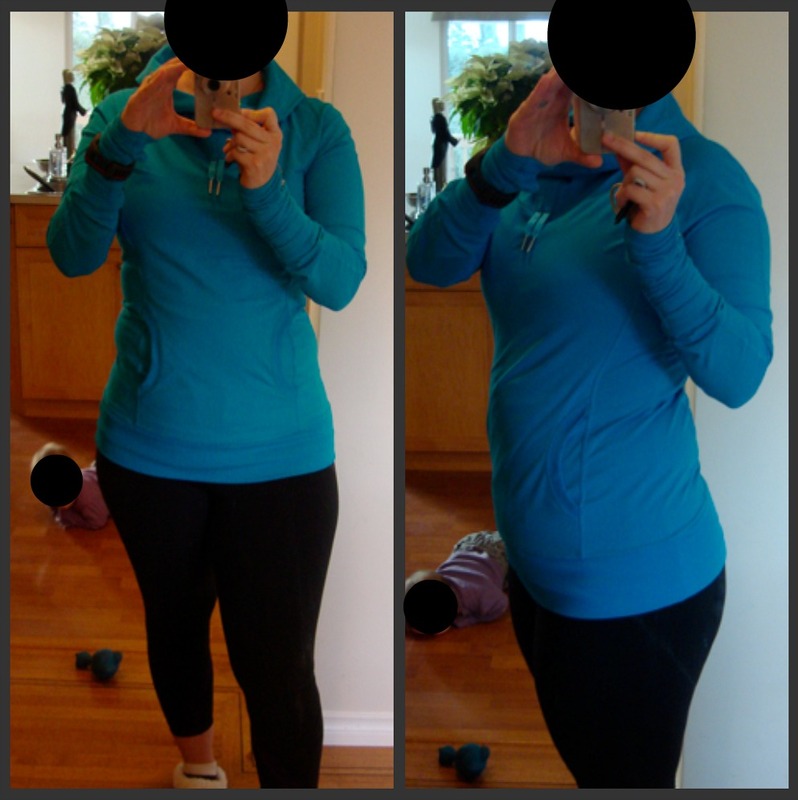 I just got back from my run wearing my new Ambition Pullover and I LOVE IT!! I did a fit review of it a few days ago over here, but that was purely based on fit and aesthetics. This is by far the most comfortably designed run pullover I have used to date for running (Run Like The Wind, Spirit, Inspire) and am so happy I jumped on it on Boxing Day because by the time I got home it was all sold out online. I had mild reservations of buying a luxtreme pullover as those are not a first choice for me (I like cozy and soft) but the fact that it’s the new brushed power luxtreme on the inside made me want to try it. Plenty cozy on the inside and nice durable luxtreme outside. Perfect sweat wicking. The thing I loved the most of this pullover was that it’s such a relaxed fit in the arms and body with no seam details or fussyness. The size 8 left plenty of roominess in my chest and arms. I loved the ribbed hem at the bottom which kept the pullover nicely in place over my luxteme tights and I loved the added length which was nice for warmth. This felt like I just threw on a cozy pull over sweatshirt. I forgot to notice if the hood pulls were bothering me which means I didn’t notice them at all during my run. I left it uncinched and my neck was a little bit cool at the start of my run but I could have cinched that up if it bothered me. The temp when I set out was 4* but with the windchill it was -1* and I was quit chilled when I started out but at 4, almost 5 minutes out I was warm enough and comfortable with just my Cool Racerback underneath, Inspire Crops and my Featherweight socks. Next time I may bring my Brisk Neck Warmer in addition to my Brisk Ear Warmers. I was planning on wearing my Brisk Run Gloves but my daughter decided to play with them a few minutes before I was leaving and she dunked them in her new water table. 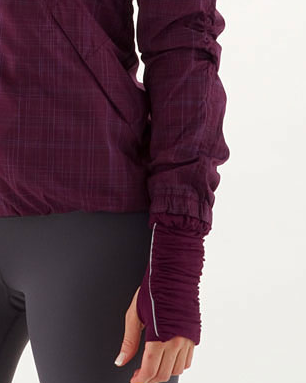 The tuck-ins were good enough to keep my hands warm and I find I’m really loving the new long ruched running luon sleeves with thumbholes and tuck ins that are in the new running jackets, Post Run Pullover and Run Pullovers. I only wish it had a watch hole. I loved using my Garmin 110 today. It is so simple to use and so easy to sync my watch to my laptop. I used to spend a few minutes writing my run into my calendar with guestimates of distance and pace after every single run. Today I just hit print and I had a graph printed out with every detail I ever will want to know. My husband splurged and got me the heart rate monitor which I’m glad about as I use a wireless one on my treadmill. I don’t use it each run because it’s a chore to remember but I like the option of using it on a once a week long run. I was really pleased to learn that my pace is a bit faster then I guestimated, especially on a short and easy does it run. On a side note, my husband gave me a nice lululemon compliment today which is rare because he hates to encourage my Lululemon shopping. In fact he likes to actively discourage it by telling me he hates Lululemon. Anyways, I’ve been wearing my Live Simply Crewneck Tee Black Roses Print a lot during the holidays and today I wore it under my Scuba hoodie. He said ‘where did you get that shirt from?‘ (duh!) and I nervously told him it was a Lululemon shirt I got ‘I dunno, a while ago I guess‘. And he said ‘I like that shirt a lot, the print really flatters your figure‘. Ok, I’m taking liberties here because he said ‘flatters your figure’ in guy terms but I wont share that here. I got my shirt online and ended up with a really pretty distribution of flowers throughout. a few areas of white space in the front with scatterings of little roses that are balance very nicely. I also got my shirt in a size down for a more fitted look then the model is wearing below. So there you have it, the Black Roses Print is guy approved. 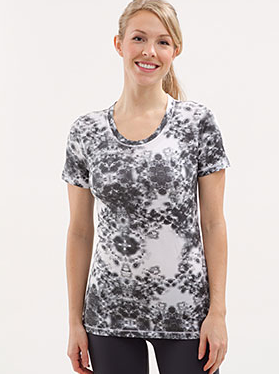 Lululemon, please make more Black Roses Print items, or reverse the print to white roses on black background. "Outward Bound Jacket Detail Shots"